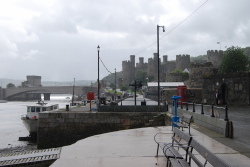 Only the 2nd day of the school holidays and off we were to Conwy, with the promise of summer arriving and the monsoon moving North apparently. Note the word "apparently". We got to Conwy late in the afternoon. The usual routine was us shipping all the gear and food for a week to the Jetty while Geke took a tour through town to "park the car". Yeah, ... right. Anyway, the current was fierce and it was therefore decided that I (Leclerc) would row with the kids, and Geke would use the harbour launch for transport. I think there is a pattern here! As it was our 18th anniversary, she actually produced a lovely gift. I was charmed to the bone and also embarrassed that had not been able to do likewise. We used the evening for a so called "evening" walk. On the way back the tide was out and in my attempt to transfer the family safely from the pontoon onto the sand bank, I got somewhat stuck in a mud bank. Toppling backward brought a wave of laughter instead of a wave of more appreciated sympathy. I start to see why the "Incredible's" family decided to retire. We all settled in early. During the night and the next day a full gale was blowing, undermining the assumption of the arrival of summer. We decided to stay put. Tuesday looked more promising with a SW F4/5 changing to a N/NE F3/4 later. Occasional rain. The plan was to go to Red Wharf bay and stay there for a couple of days. At 11:55 the motor started rumbling, which was 3 hours before HW. The wind was close to an F5 inside the bay but dropped to nearly nothing on one of the legs North of Puffin. Puffin, if one notices carefully on the map is marked as an island, just off Anglesey. This is a misconception. It is actually floating and moves away in front of you while you make way beating against the wind. My other theory is that it actually shrinks while you approach it, giving the magical experience that it is always at the same distance, independent of how many hours you've tried to sail towards it. Too much sail maybe Dad? North of Puffin the wind sort of disappeared while I could clearly see a yacht heeling over South of the Island. So we went in search of the local weather and found it. It took a bit of time to work out that reducing sail, reduces healing without sacrificing speed. 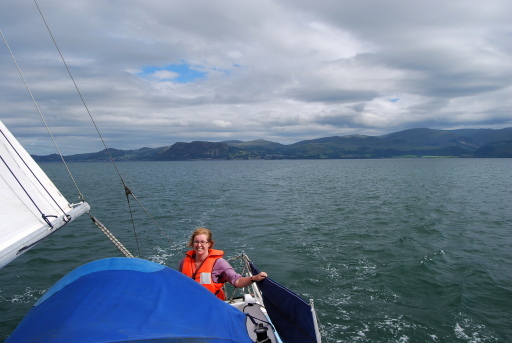 After all the pots and pans and kids were safely stowed away, we continued nearly horizontally along Anglesey towards Beaumaris. No we were not lost but the plan had been changed as the 14:00 forecast mentioned a possible F5 from the NE. This makes Red Wharf bay a bit exposed, which creates sleepless nights, which creates moody parents, if you get my drift. Oh lets not mention the word drift ... yet. 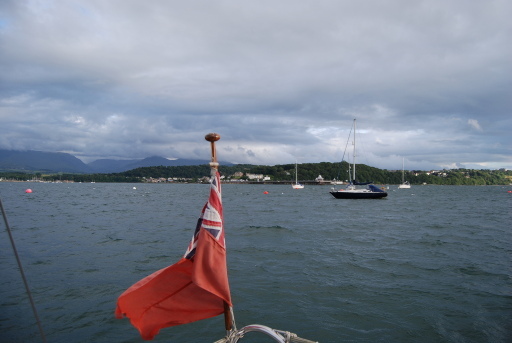 As soon as we picked up a mooring buoy, someone from the Beaumaris pier started shouting at us and pointing frantically back to Conwy. From his hand signals and glowing head I deduced that we were not welcome to use the chosen buoy. Now how does one signal with hands and arms that we needed 5 minutes to do complicated tide calculations, after which we would move on? I thought this is where a VHF radio call could be productive but no attempt was made. We moved on and indeed, within 20 minutes, a fishing vessel appeared to take "our" mooring promptly. Anyway, by 11:30 we floated again and we were free to go. 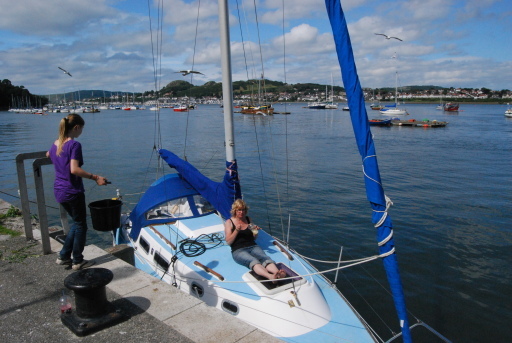 In the battle against sea sickness, which tends to come around in Conwy bay while Puffin does its "catch me if you can" act, we suggested that Meryl and Timo should get more involved in the sailing. 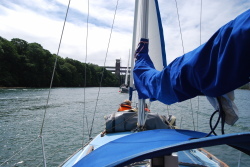 Timo took up the advice and was found steering our Griffon towards Menai Bridge. The Swellies slack was at 14:15 and our timing was spot on. 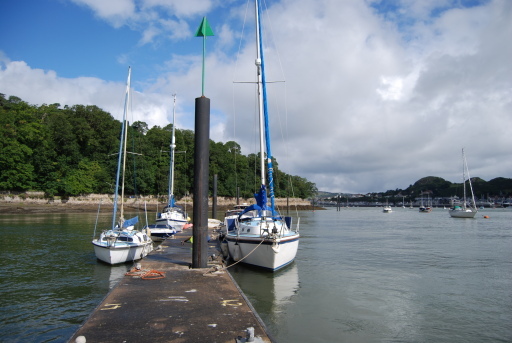 We sailed past Port Dinorwic and we all looked out for the small wooden mast of Seaghost. She was still there. 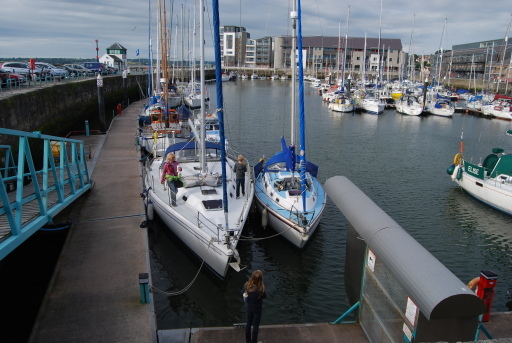 At 15:30 we arrived in front of Victoria dock (Caernarfon). 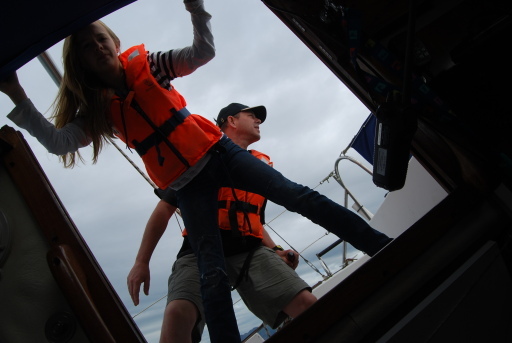 A radio call to the harbour master resulted in somewhat confusing instructions where to moor up. 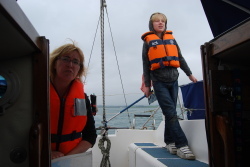 Well, confusing for me, as the kids knew where to go and we moored next to a somewhat larger yacht. 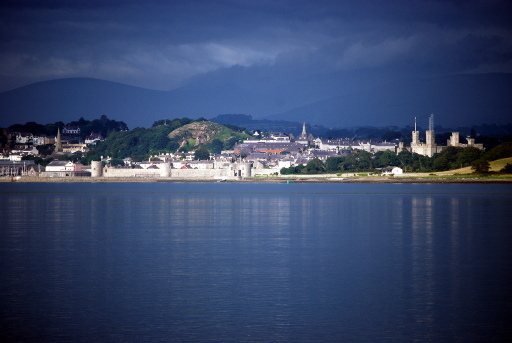 That evening we walked around Caernarfon, had a seventies meal in a pub and had a shower in the marina. The weather cleared up nicely and the sun came out. Straight after the turn of the tide a fierce ebb flowed past us and we had to have dinner first before we were able to row ashore. The area is outstandingly beautiful. 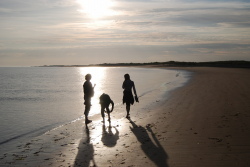 We made a lovely beach walk. Meryl and Timo played on the beach for a bit, and the water contents of Timo's trousers increased dramatically when he decided to sit in a shallow pool. 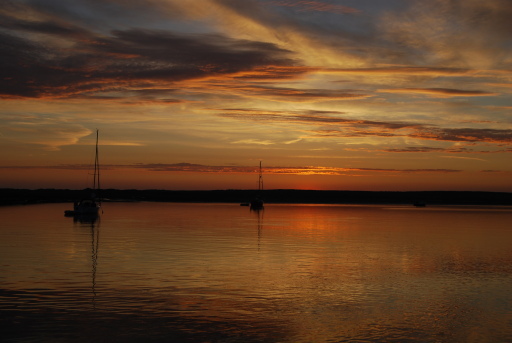 We returned to the boat to be treated to a beautiful sunset. Not quite knowing how the anchor would behave, I set an alarm clock for anchor watch. At 04:10, a look toward where the other two yachts were expected to be seen was a disappointment. They were there but in the distance. Next the rush of water around the hull was a worry, albeit still an indication that the anchor was doing some work. It appeared we had moved. That, for the non-sailors reading this, means putting on warm clothes, starting the engine and hauling the anchor back in to reset it. All in the first morning light and in the name of a relaxing holiday. To further enhance the early morning exercise, in the process of hauling the anchor in, the trip line and buoy attached to the anchor, became fouled and tangled nicely around prop. 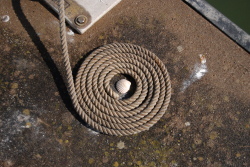 The rope cutter did its work and remains were hauled on board. 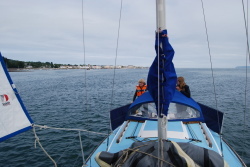 We motored in between the 2 other yachts and on the 2nd attempt the anchor set again, after we had ensured our neighbours had just as little night rest as we had. Fair is fair. Meryl slept through the whole episode and only raised an eyebrow the next morning when we did not appear to be in the same place as the night before. 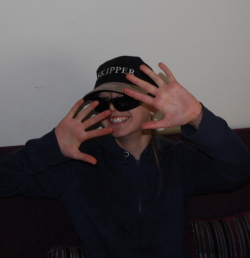 We would have been halfway Ireland if we relied on her doing the anchor watch. 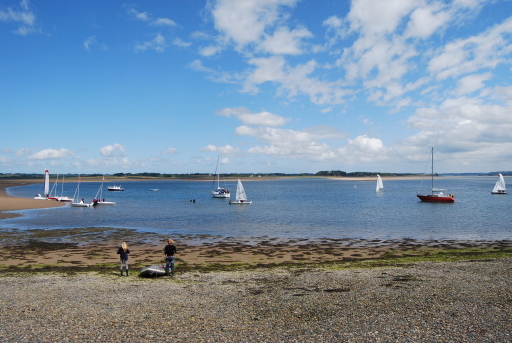 The next morning the bay was invaded by the Plas Menai sailing school. 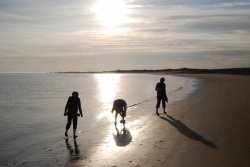 After another beach walk we were ready to head back to Bangor in search of a good night sleep. A stiff F4 was blowing from the West across the bay. At 15:00 we were on our way again and we had a lovely sail towards the Swellies. Initially our timing toward the Swellies looked timed well, but we still appeared late at the Britannia bridge. Being late in the North Easterly direction means the tide can very quickly turn against you (increasing 1 knot every 10 minutes at a spring). However, as it was a neap, no current was noticed all the way up to Bangor. 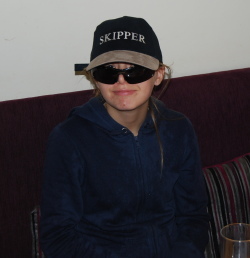 The skipper was, for unknown reason, intent on a good night rest and pushed all the way into the protection of the concrete wall of Dickies old harbour, while the depth sounder was screaming in alarm. We did moor up safely and had an undisturbed night rest. The weather forecast was a stiff breeze from the west (F4/5) and we decided to stay put. 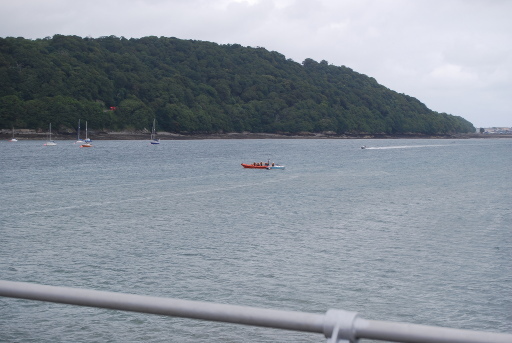 Near the Bangor pier we saw 3 men arriving and pointing towards the sea. Apparently unrelated, I noticed a small open motor boat casually floating past on its way to the Isle of Man. Traditionally these boats have someone to give it direction (often referred to as the skipper), and this one appeared to be without one. 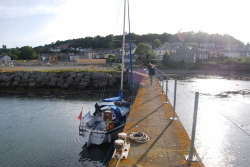 We walked up onto the Bangor pier to investigate. It turned out to be adrift. This was my moment to be a family member of the Incredibles again. Mr Incredible Decisively the skipper used the hot line, provided on the pier to ring the emergency services. The phone had 3 buttons, all labelled with 999. It took a while to work out which button to press, but button 2 seemed a good choice. I had immediate contact with a kind lady who asked me without hesitation which service I required, as if it was daily routine for her. A few seconds later I was speaking to the coast guard reporting the incident. The 3 men reported earlier, now started to make sense, in that their restless pointing was not about the beautiful coastline but more that their boat was adrift. In the mean time the RLNI launch was approaching from Beaumaris and another 999 call linked the owner up with the coast guard to provide direction where they wanted to meet up with their beloved but untrustworthy little vessel. They told us it was their first time fishing on the sea. Probably their last as well. The monsoon returned and we took shelter in a pub where a local ex-alcoholic (2 hours dry) was practising for his gig that night. We appeared to be his greatest (and only) fans. We wanted to head back to Conwy the next day but the forecast kept insisting on an F5 from the SW. Our plan was to leave early. 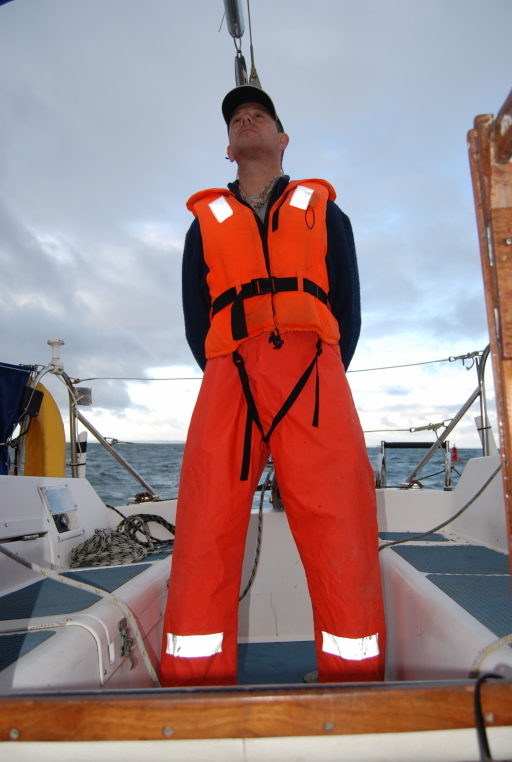 Partly to get that sailor feeling of getting up at ungodly hours, partly to have enough day light for if the sea proved to be rough and we wanted (needed) to seek shelter. 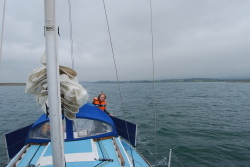 We attempted to moor up on Hazel Anne's original deep water mooring, off the Gazelle. We could not find a buoy with her name on and settled on one as much inshore as possible, to stay out the swell and get a good nights rest. Too early in the morning, the depth gauge went off indicating less than 1.4 m water under the keel. I switched it off, ignoring the consequences. The result was that I could not sleep, with pictures in my mind of razor sharp rocks luring just under the surface. 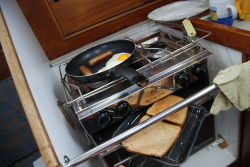 At 04:30 the alarm clock helped to enhance that sailor feeling and a quiet routine followed of preparing the boat and swallowing dry sandwiches, helped down with strong coffee. At 04:45 we set off and we sailed for the first time with the navigation lights on. The plan was to sail up towards Puffin and cross the Swatch at B6. The sandbank crossing was nicely programmed into the GPS. The GPS however, had not enjoyed an early morning coffee and complained about low batteries. The 2 sets of spare batteries created the same complaint. Therefore I decided confidently to navigate by dead reckoning. How difficult can it be? Well, quite. Course set out in 4 legs, 4 courses with 4 distances to sail. The GPS was switched on at intervals as back up (as what it should be). 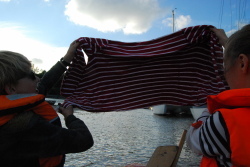 However, it didn't take long before the depth gauge indicated shallower water, meaning we lost the channel. 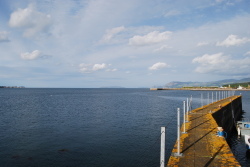 The hand compass could not be found to make a cross bearing on Puffin and Great Orme, the watch compass found Puffin and Beaumaris on roughly the same bearing and the wind was increasing. Oh sh**. Ok, the last brief reading on the GPS was used as a reference point (which essentially marks defeat) and from there a bearing on the Fairway buoy was set. Fairway did appear eventually in the right direction. Some cause for concern on my navigation skills is appropriate. 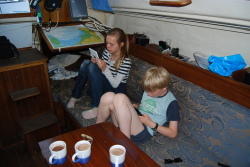 Mental note to check the ships log against GPS log. Progress appeared to be much faster on the ships log. This was not noticed in the days before where the difference between the 2 was used to estimate current. The last 3 Nm were a bit rough with the sea becoming unsettled on the Conwy shallows. Spot on, at 08:00 we arrived at our pontoon, only to find it occupied by another yacht. A nervous twitch played on my eyelid and I played briefly with the thought of ramming, followed by entering and cutting their mooring lines through, but instead I choose to perform a perfect mooring manoeuvre in the tight spot left over. The crash woke them up. They had sailed from Rhos on Sea toward Red Wharf bay the day before but then decided Conwy was an easier target than the long beat upwind. After tidying up, we all longed to get a shower at home and after breakfast at lunch time we headed back to Selattyn.